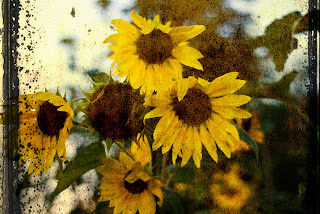 The last of the sunflowers. We will be going to Portland on Thursday for a little shopping trip. Plans to go to Tin House Publishing, they are the publishing company for The Dart League King, Keith's book. Then some shopping and a trip to University of Portland and then whatever else strikes our fancy. just glad it is a short week. A last kiss of summer... beautiful photo.